Casino-Mate has the 500 best slots from the several top game developers they work with. 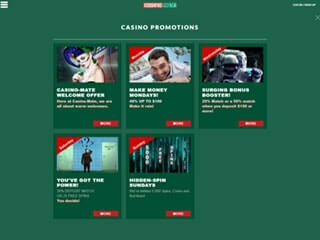 Join, get the casino’s excellent set of welcome bonuses, promotions, bonus codes and play on forever! Casino Mate has a lot to offer online casino gamers. They offer new players 80 free spins in a no deposit format. They divide the free spins into four equal units so you can get to know the casino in stages. Getting to know Casino mate takes a little time because they feature games from several excellent providers. They have 500 slots alone. The slots all combine entertaining themes and characterizations with great bonus rounds and top notch graphics and animation. Casino Mate excels in several other areas notably promotions and their VIP Club. We think it odd that the casino has not yet put together a loyalty programme for average players but the VIP Club certainly gives high rollers top attention. Casino Mate has a few banking options. Again, a minor point perhaps but one worth noting, the casino has not yet jumped on the Bitcoin bandwagon. Surely, that will change soon. Overall, we’re confident that this Casino Mate Review will give you all the information you need to evaluate the casino in light of your own gaming style and needs. The casino has an amazing 500 slots from several top game providers. Having a number of providers means that the casino can choose only the very best games from each. It’s a testimony to the overall excellence of the many providers Casino Mate works with that the casino has chosen so many slots. You’ll probably never find a boring slot at Casino Mate Casino. The casino also has 25 blackjack variations; 14 roulette games including European and French, our favourite roulette games; 50 variations of video poker including many with a multi-player option; craps; baccarat; many forms of table poker; VIP Pai Gow; bingo; keno ; and scratch cards. Of the slots, fully 39 are progressive jackpots games! The Casino Mate welcome package comes in four stages. In each you get a deposit bonus and 20 no deposit free spins. They call the no deposit bonus “zero wager” but it amounts to the same thing. To access both the deposit and the no deposit bonuses you need to enter the correct Casino Mate bonus code. The percentage rate for the deposit bonuses begins at 100% and then drops to 50% for the last three bonuses. The dollar amounts begin at $200, rise to $300, then $400, and finally $500. Casino Mate offers deposit bonuses on every Monday, Wednesday, Saturday, and Sunday. You don’t have to play on those days but we think it’s a good idea to go into the casino whenever they offer a deposit bonus and grow your account with the casino’s own money. When you apply for a bonus be sure to remember to enter the correct bonus codes. High rollers join Club Mate where they receive the full VIP treatment. This includes larger and faster withdrawals, special bonuses and promotions, a one-time welcome package when you qualify for the Club, a personal manager who will dedicate herself or himself to making you always feel like the VIP you are with gifts and special incentives. We prefer a casino to give bonuses without bonus codes but if you remember to enter the Casino Mate no deposit bonus codes for each bonus, you’ll enjoy as many as 80 free spins! Casino Mate Australia offers eight deposit options. As far as withdrawals are concerned, they can take from 3-5 days if you are going through a bank or credit card but they claim that withdrawals go through instantly if you use the three ewallets the casino works with. Instant withdrawal may also not be the best because many other casinos require that you prove that you are you as a way of protecting you. We think that waiting a bit for withdrawals is good even though the casino is protected by the best encryption software around. You never know when someone might steal your identification independently of the casino. 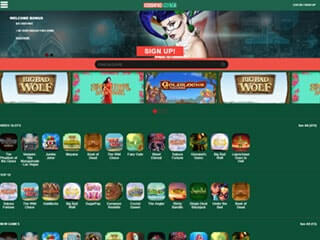 The casino offers three gaming software platforms. For the desktop casino, you have Casino Mate flash technology and download. For the busy Aussie, the casino has an excellent mobile platform. 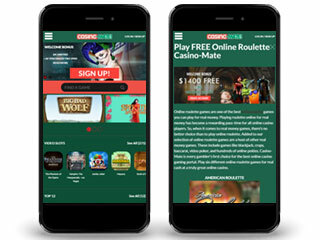 Casino Mate mobile offers almost as many games as in the download casino platform. Mobile has become the favourite gaming platform of players in many countries including Australia. The big change in mobile is the great, new graphics technology. Although most players access the mobile platform through the Casino Mate Android or iOS platforms, the mobile platform is accessible to almost any mobile device at least as pleasurable as on a desktop computer and far more comfortable as you can lounge on a soft sofa and play. The Casino Mate customer service office stays open 24/7/365. You have three options for contacting their well-trained representatives: chat, telephone, and email. In each case, response time is quick. The casino states clearly that they consider customer service to be as important as all their games, promotions, and bonuses. Most Casino Mate reviews make a point of mentioning the massive number of slots on offer. We are no exception. However, we also pointed out a few small negatives along with the many positives. All in all, this is a fine online casino and one that is likely to get better in future.